The hypocrisy in relation to the Dutch Memorial Day of World War II is shameful, writes Marjolein van Pagee, historian, photographer and founder of Histori Bersama. “It gives me a stomach pain,” said Dutch politician Lodewijk Asscher (PvdA, Dutch Labour party) in response of the protest that the activist group ‘No 4 May For Me’ announced. The authorities already said that the demonstration is a criminal offense. But is there, historically, nothing more important than the people who got victimized by German and Japanese fascism? In fact, in what way is this a reflection of respect and above all democratic freedom when we can only talk about our victim role? The sincere disbelief Asscher and Dijkhoff showed when they heard about the announced demonstration is the typical disbelief of a nation that is suffering from ’empire syndrome’. The dazzling effect that occurs when you live for too long in the safe, pleasant cocoon of world power. The people of the Netherlands, as part of the prosperous ‘developed’ West, have come to believe that they are the most fair and innocent people on earth. The shocking reality is that the prosperity is based on robbery: then and now. Processing the colonial past has been so difficult because Western power has never been broken. Colonial perpetrators have never been prosecuted. There is no higher power that corrects the Dutch when they are justifying their own wrongdoing. For example suggesting that they are the democratic, progressive examples for the rest of the world. The idea that Western countries spread free democracy all over the world is just propaganda. Because who put oil on the fire in Syria, Iraq, Libya? In whose interests did these foreign dictators fall, who is (still) at the top of the hierarchy? Why has Bush not been tried in front of the international court for invading Iraq? The answer is simple: because the robbery and murders from colonial times are still committed. There is a continuation. Western colonialism ‘old style’ has changed into colonialism ‘new style’ from the 1950s onwards. That is, US imperialism and interventions, supported by Western European countries such as the Netherlands. This new style is a mutation from of the old style. It is more subtle, more indirect, but still using ‘divide and conquer’. As being one of the most loyal allies of the United States, Dutch Prime Minister Rutte can only say that he is fine with bombing Syria, even when there is no proof and international treaties are being violated. 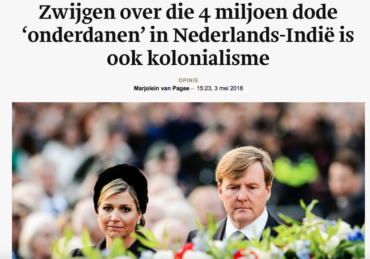 It is understandable that if you don’t see this continuity and lack general knowledge about the colonial past, you won’t get the reason why the Dutch Annual Memorial Day of May 4th is being criticized. During the ceremony the Dutch National Committee ‘4 and 5 May’ officially claims to commemorate all victims (not perpetrators), however, that is not what they do. In the context of the Japanese occupation of the Dutch East Indies (1942-1945), only 24,000 Dutch citizens are commemorated. The shameful reason that the actual death toll of 4 million is not mentioned is that those people were only considered ‘subjects’ in the colonial apartheid system. In the Dutch East Indies the local Indonesian population only got Dutch ‘subject’ status, they didn’t get a Dutch passport and did not enjoy the same rights as Dutch citizens. The Dutch commemoration becomes even more problematic when the Indonesian war of independence (1945-1949) is mentioned and only the 5,000 Dutch soldiers are commemorated as defenseless victims. While the truth is that some of them even committed crimes equal to what German SSers did. The point is that during this annual ceremony, when almost the whole country is watching, the Dutch authorities refuse to mention that in this case the Dutch were not victims but occupiers themselves when they launched a war against the sovereign state of Indonesia. Don’t forget that what the Germans are to the Netherlands, are the Dutch for Indonesia and perhaps even worse. That is the hypocrisy where I got stomach pain from, Mr. Asscher!